Think you tasted all the Italian pizzas out there? Well, then switch gears and try an authentic American pizza. 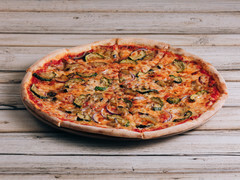 Pizza Americano lives true to its name, being different in style, structure, and taste compared to any Italian pizza. With a list of ingredients that go a mile long, this pizza is bound to be different, exciting, and adventurous in ways you never expected pizza to be. 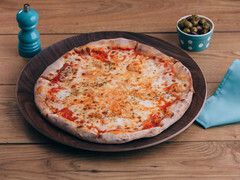 If you’re brave, you might even decide to have a go at making your own pizza Americano. But if you just want to grab a bite out of this delicious pizza, give us your order, and we will deliver! First things first, I know most pizzas are easy to make… but this isn’t one of them. The pizza Americano is especially known to have more ingredients than any normal pizza. The way it is prepared is quite different, all the way from the dough to the topping to the way you're supposed to bake it. You might even require special equipment in order to make this pizza since the structure s different from most styles of pizza you know and love. But of course, as always, you definitely should go ahead and try, if you have the will. Once you master this dish, you could officially hold yourself a title as a pizza chef. On top of that, you should be able to whip up great delicious pizza Americano’s whenever you feel like it. Pro tip: You need a thicker base for this pizza. Consider pairing two balls of dough. Naturally, I’m not going to sugar coat the fact that this pizza is quite hard to make. 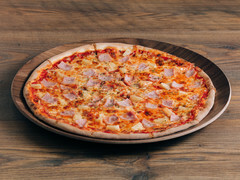 Even the most experienced pizza makers find it hard to carry the pizza into the oven without breaking it, thanks to the number of ingredients topping the thing. This is why you need an extra thick base. If you don’t happen to have a lot of experience making pizza, you stand a chance of having a rather odd shaped final result (yikes!) But just because making the pizza is hard doesn’t mean that eating the pizza is. The pizza Americano is absolutely delicious (I mean, with all those ingredients, it’s nearly impossible not to be). So what do you do when you have absolutely got to eat a delicious pizza Americano, but don’t want to spend a good year perfecting your skills and getting new equipment ready to make this pizza? Well, you order it from our 1200+ restaurants that have expert pizza chefs who are more than capable of making the best, prettiest Americano you have ever seen or tasted in your life. You can simply order online. It’s fast, it’s easy, and it’s convenient. What more could you ask? Naturally, I’m not going to sugar coat the fact that this pizza is quite hard to make. 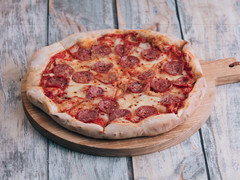 Even the most experienced pizza makers find it hard to carry the pizza into the oven without breaking it, thanks to the number of ingredients topping the thing. This is why you need an extra thick base. If you don’t happen to have a lot of experience making pizza, you stand a chance of having a rather odd shaped final result (yikes!) But just because making the pizza is hard doesn’t mean that eating the pizza is. The pizza Americano is absolutely delicious (I mean, with all those ingredients, it’s nearly impossible not to be). So what do you do when you have absolutely got to eat a delicious pizza Americano, but don’t waNaturally, I’m not going to sugar coat the fact that this pizza is quite hard to make. 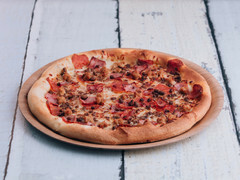 Even the most experienced pizza makers find it hard to carry the pizza into the oven without breaking it, thanks to the number of ingredients topping the thing. This is why you need an extra thick base. If you don’t happen to have a lot of experience making pizza, you stand a chance of having a rather odd shaped final result (yikes!) But just because making the pizza is hard doesn’t mean that eating the pizza is. The pizza Americano is absolutely delicious (I mean, with all those ingredients, it’s nearly impossible not to be). So what do you do when you have absolutely got to eat a delicious pizza Americano, but don’t want to spend a good year perfecting your skills and getting new equipment ready to make this pizza? Well, you order it from our 1200+ restaurants that have expert pizza chefs who are more than capable of making the best, prettiest Americano you have ever seen or tasted in your life. You can simply order online. It’s fast, it’s easy, and it’s convenient. What more could you ask? 1) Preheat oven to 475 degrees F. Lightly coat a very large baking sheet with nonstick cooking spray. Roll out Thin Crust Pizza Dough according to directions to a 12x8-inch rectangle. Slide onto prepared baking sheet. Bake for 5 minutes. Remove from oven. If dough has puffed up during baking, prick it generously with the tines of a fork. 2) Meanwhile, place sliced mushrooms in a small microwave-safe bowl. Microwave on 100% (high) power for 2 to 3 minutes or until mushrooms are tender, stirring once. Drain mushrooms. Spread partially baked crust with pizza sauce. Top with Canadian-style bacon or pepperoni and mushrooms. Sprinkle with cheese. 3) Bake 9 to 11 minutes or until cheese is melted and crust is lightly browned. Remove from oven and sprinkle with green onion. Slice into 6 pieces. Serve immediately. Nam ac ex pretium, lacinia diam sed, euismod tellus. Nunc eros justo, fringilla in suscipit gravida, mattis ac orci. Maecenas id nibh sollicitudin, lacinia odio in, viverra orci. Ut et commodo tortor. Morbi id feugiat dolor. Cras metus ipsum, porttitor sit amet ornare sed, blandit eu diam.